We’ve been teasing you with hints and glimpses of our remodel for over a year, and now the time has finally come to unveil the new Arden Jewelers! 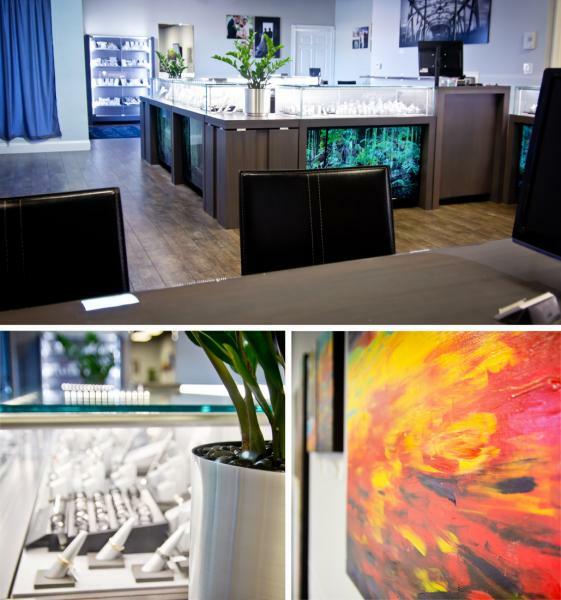 We have reinvented our entire shop literally from floor to ceiling to bring you a totally unique jewelry experience where the focus is all on you. Taller showcases with bezel-less glass make it easier to see the jewelry. All new displays allow us to better group jewelry, so you can discover hidden treasures and new favorites. Even the artwork is from local, Sacramento artists like Conner Schuh and Lucia De Bono. A totally unique panoramic video wall completes the immersive experience. One of the consequences of our new display layout is that we now have a lot more jewelry than we can fit in the showroom. So, to celebrate the completion of the remodel, and to make room for some amazing new pieces we are having a storewide 25% off sale. With the exception of Mark Schneider and Jen Lesea Designs, every piece in our showroom has been marked down for a limited time by at least 25 percent! Rose gold and morganite jewelry. The combination of soft pink gems like rose quartz and morganite with rose gold creates a beautiful and very trendy look. Select pearl jewelry. Pearls are a timeless classic, and no accessory drawer is complete without a set of go-to pearls. We are featuring a modern, and stylish collection of pearl earrings and necklaces this year at incredible prices. Select opal jewelry. These dazzling pieces feature gorgeous Australian and black opals set in stylish rings and pendants. The Rare and Beautiful collection of one-of-a-kind pieces handmade with uncommon gems. It’s been a long journey, and we’re so excited to finally be able to share the finished product with you. So, visit us today and see it for yourself. You can even take advantage of these incredible deals to cross a few names off your Christmas list while you’re here. Yes, sign me up for the exciting email newsletter! Now You Can Text Your Jeweler, OMG!